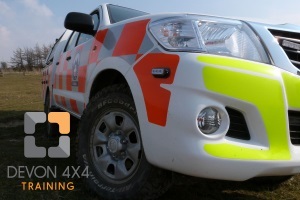 Professional and dedicated: Devon 4x4 Training's instructors provide you with Lantra-Awards certificated training in your workplace, anywhere in the South-West, or from one of our specialist venues. Email us for details. Professional on and off-road driver training with the experts. 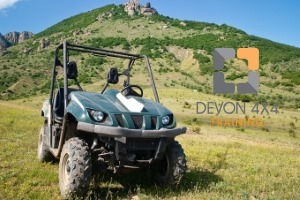 We provide comprehensive 4x4, quad bike and ATV courses in Devon and across the South West. With Lantra-Awards certification, bespoke consultation and risk assessment, we can enable Health and Safety accountability and compliance. On Road and 4x4 Familiarisation, and Off Road 4x4 Training from our approved sites in north and east Devon, B+E trailer test training in Exeter, Quad Bike Training, ATV Training Courses and Off Road Driving Days. All of our courses are run by Beyond 4x4 qualified off road trainers. 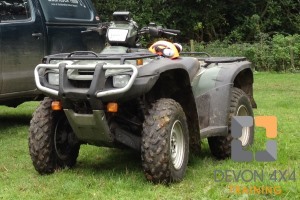 Quad bike training courses are available across Devon and the South West. The Lantra-Awards certified Sit-Astride ATV course assists PUWER compliance and can be run either from your workplace or at one of our off-road venues. An HSE recommended course, it can include rough terrain, loads and mounted equipment, as well as trailers and trailed implements. The course can be adapted for specific purposes such as snow-ploughing and towing gritter trailers with quads. ATV training courses can be run in Devon or across the South West, either at one of our venues, or in your workplace. The Lantra-Awards Sit-In All-Terrain Vehicle certification is designed to ensure your operators understand the capabilities and limitations of their Ranger, Gator, Mule, Kubota or other side by side UTV. ATV Training can be adapted to environments as diverse as car-parks to mountain tops, and include loads, trailers and towing, snowploughs and gritters. Whatever purpose your ATVs serve, we will provide appropriate training.